Just last year, Divergent glimpsed a dystopian future where destinies rose and fell with the company you kept, and social cliques were used to enforce a merciless pecking order. In short, high school all over again. 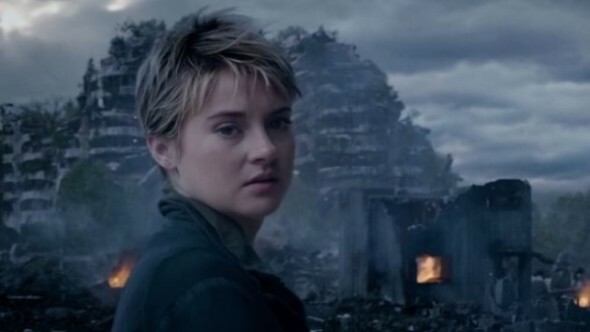 Insurgent, part two in the latest “three books as four movies” franchise, ups the ante on action, but delivers little more than some flashy CGI amid a formula growing increasingly tiresome. Tris Pryor (Shailene Woodley) and her boyfriend Four (Theo James) are on the run from henchmen sent by Council leader Jeanine (Kate Winslet). Seems Jeanine has uncovered a strange, Hellraiser-looking puzzle box containing a message that could end the civil strife among her subjects. But this box can only be opened by a “divergent” with enough specialness to pass a variety of deadly tests…so Jeanine is hunting them all down to find the one. Whoops, I mentioned “the one,” so I’ll pause now while director Robert Schwentke swoops in for a quick tight shot of Tris looking pensive. Get used to it. There are some nifty visual sequences, but the core of Insurgent remains overly familiar young adult elements and overly bland presentation. The special girl burdened with a uniqueness she didn’t ask for, angst, melodrama, parental issues, walking among the rubble…all the basics are here. Ironic, then, that Schwentke (R.I.P.D., Red) doesn’t seem interested in moving his film beyond the ordinary. The dream/virtual reality red herrings are as numerous as they are obvious, and those high drama arm -grab turnarounds are better left to the daytime soaps. Woodley is one of the best young actresses working, and she is plenty spunky during Insurgent‘s action scenes, but she’s saddled with dialogue and direction that is difficult to elevate. Even the great Winslet is reduced to standing still and looking villainous. Attempts at social commentary are clunky at best, while contrivance in the script finally gives way to outright laziness, as when the common folk are enslaved by a behavior modifying implant which can’t be removed – until it is. Tris is told, “We finally found a way to remove it.” Okay, then. Two more Divergent films may be coming, but Insurgent will only leave you eager for the next round of Hunger Games.